Profitez de votre vaccation dans les confins de la PGA National, une prestigieuse communauté fermée située dans les jardins de Palm Beach, en Floride. Notre maison de l'immobilier est dans un cul-de-sac et est 3300 pi / ca sous air et le système de sécurité, avec golf (pas 2 t et 17 vert sur le Squire) et vue sur le lac, une piscine, un spa et garage 2 voitures. Ce est un cinq minutes de marche (descendre la 18e sur le Squire, un par 495 verges 5) à la station PGA National de renommée mondiale et un spa. Notre maison a été entièrement modernisé et rénové offrant une grande cuisine, une grande salle de séjour avec télévision à écran plat et chaîne stéréo haut-parleurs montés intérieures et extérieures. La chambre principale dispose d'un lit king size, TV écran plat, un grand walk-in et une salle de bains généreuse. Les deux autres chambres, qui sont maître taille de chambre, ont des placards walk-in et salle de bains récemment rénovées. La cuisine est entièrement équipée avec des appareils de premier ordre. Nous avons une grande terrasse avec mobilier de salle à manger, barbecue, golf et vue sur le lac, piscine privée avec des jouets de piscine et beaucoup de soleil. En Floride, vous pourrez profiter de quelques-uns des plus grand golf aux États-Unis. PGA National a été l'hôte de la Classique Honda, la Ryder Cup et le Championnat de la PGA. Notre maison est à environ 10 minutes de la plage, les jardins Mall (mettant en vedette Saks, Nordstrom, Macy et Bloomingdale), de nombreux restaurants dans toutes les gammes de prix et bien plus encore. 15 minutes de Palm Beach et de City Place, Worth Avenue et Kravitz Center for the Performing Arts. Si vous aimez l'équitation, nous recommandons le «M Running ', un grand ranch et personnelle à propos de 10 minutes en raison ouest. 15-20 minutes de l'aéroport de West Palm Beach. Nous n'avons pas d'adhésion de golf à PGA National. Loved the place! Would definitely use it again! We stayed at this beautiful home for a week in July 2018. The set up of the house is great with 2 bedrooms on one side and the third bedroom on the other side of the house with the kitchen, dining room and family room in between. It worked out great for our family of five as there was plenty of room to spread out. Probably the best part about the house (at least if you ask our kids) is the really large pool which is actually big enough to swim (!) in. The owners (Patrick and Lena) are very friendly and very responsive to questions and emails. The house is in excellent condition and the location inside the PGA golf community makes it extremely quiet and enjoyable. We would love to be back - a perfect place for a perfect vacation. We had a great time staying here. The house is perfect for large families and the location on the golf course makes for a very peaceful and quiet setting. The kitchen was well stocked and the house was very spacious and comfortable. We were in Palm Beach for a golfers reunion of sorts . There were 3 of us in total with a fourth living in the area. The house was terrific ,very spacious with large bedrooms and all the amenities you could imagine. Thanks to Patrick and Lena for making the rental as easy as it could be and helping us plan our vacation with golf course suggestions. We will be back next year for another reunion ,it was perfect. I spent the month of April, 2017 staying in this wonderful home. Besides being beautifully decorated and comfortable, it is also IMMACULATE. During my stay, I never saw one insect (not even an ant). The owners (Patrick and Lena) are very friendly and very responsive to questions and emails. 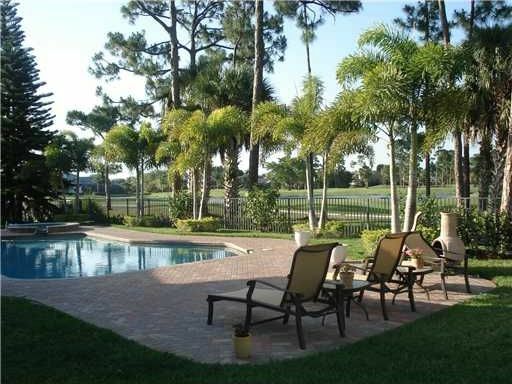 The home is situated in an ideal location with easy access to the PGA Resort, I-95 and the Florida Turnpike. I enjoyed my stay so much that I have already put down a deposit to rent this home for 6 weeks next year. I'm looking forward to it. We stayed 3 weeks in this house and loved it. The set up of the house is amazing with 2 bedrooms on one side and 1 on the other with the kitchen, dining room and family room in between. It worked out great for our family, plenty of room to spread out. I loved the kitchen and how it was set up and it has a small table with 4 chairs in it, the refrigerator is quite large, which worked out really good for us. It has a garage so you can park your car inside, which we liked a lot.The lanai is amazing and really large and screened in and has 2 table and chair sets on opposite ends. We spent a lot of time sitting out there and we ate almost every meal there. The pool deck is nice with plenty of lounge chairs and tables and it also has a fire pit if you like to do that. There is only one negative and for most people it really isn't a big deal but since we knew it had a spa, we assumed it and the pool were heated and they are not. Our grandkids are usually in the pool a lot but weren't this time because it was a little cooler than normal and the water was really cold. The location of this house is amazing, close to everything and is in PGA, which is a gated community. The owner of the home is amazing to work with and anytime I emailed him, he replied right away. I highly recommend this home, you will not be disappointed!!!! A $500 refundable deposit is due at the signing of the lease. In most instances we have a 5 day minimum stay. The prices above are only examples and not 100% correct, since the pricing system will not allow multiple pricing for the difference in seasons. Weekly rates vary from $1500 (June, July, August) to $5500 (Dec, Jan, Feb, Mar) and monthly rates vary from $3700 (June, July, August) to $8600 (Dec, Jan, Feb, Mar). Prices vary depending on different factors such as: season and how busy the week/month is, and what weekday you're checking in/out, when the next guest is checking in/out Contact me for last minute booking.